WOW! 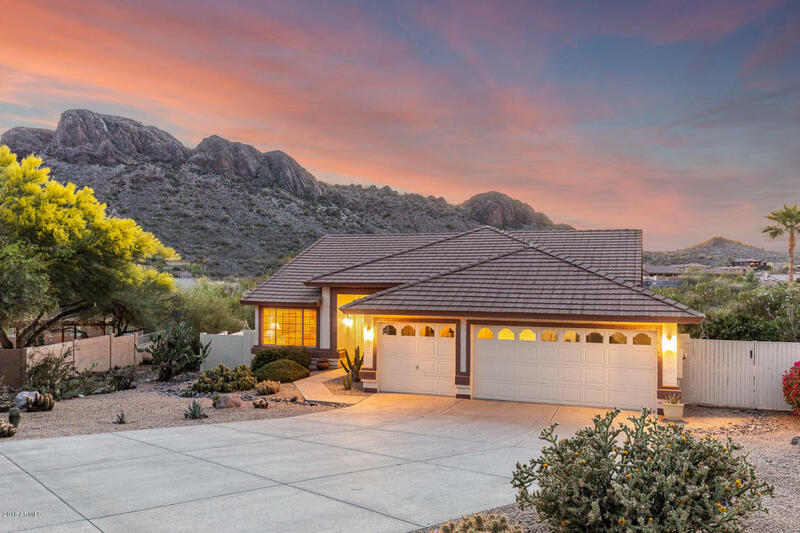 Jaw dropping DOUBLE MOUNTAIN VIEWS from this home located on a large 16,000 sq ft Cul-De-Sac lot! FLEXIBLE FLOOR PLAN with den/office/3rd bedroom plus LARGE MASTER SUITE and LARGE 2ND BEDROOM (feels like two master bedrooms)! Many special features throughout including...large open kitchen with GRANITE COUNTERS, center island/breakfast bar with pendant lighting, VAULTED CEILINGS, arched doorways, FIREPLACE, tile and wood laminate flooring, BREATHTAKING VIEWS from every window and so much more! Relax and enjoy the the MOUNTAIN & SUNSET VIEWS from the extended tiered patio and large fenced backyard with MULTIPLE SEATING AREAS! Don't wait too long! MUST SEE!